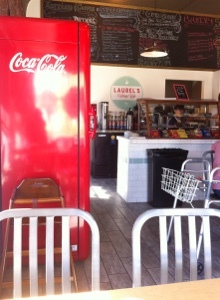 As I sit in quite possibly the most adorable little restaurant in town, I just feel like I have to write about it! You see, this little town of ours has so much potential for quaintness and uniqueness. Our town is something special, in part because of the wonderful community’s for folks who live here, but also because of these businesses who are striving to succeed in bringing those unique elements to our town. In a town where “word of mouth” can make or break you, I think we need to be extremely conscientious of those words and strive to build our town up wherever and whenever we can. That’s how Ripon thrives. So this morning, instead of getting the bacon, egg, and cheese biscuit from Carl’s Jr. (yes, I’m a huge fan of that glorious fattening deliciousness), and instead of plopping down at Denny’s to write, I intentionally chose Laurel’s because I had never been here and the fabulous green signage has been catching my eye every time I drive around the corner of Stockton and Main. 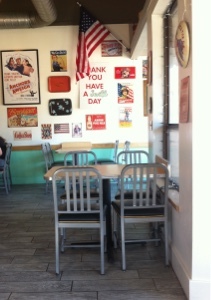 The retro design of this place immediately made my heart happy – there has definitely been a makeover from when it was the delightful Corner Stop Eatery. Everything: the floors, tables, chairs, countertop, and colors – totally my style, even the classics in the speakers: Singing In the Rain, the Rat Pack, oldies to my heart’s content! The strawberry blonde sporting a kerchief in her hair was super sweet as I was chatting her ear off about the varieties of food/coffee to see what choices I had. 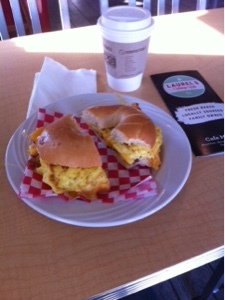 I settled on a breakfast sandwich, as that seems to be one of the most popular breakfast items at Laurel’s, and after my first bite, I understand why! Eggs, smoky bacon, and cheese on a soft bagel, so good! But if I’m going to be honest, I can’t wait to come back and try their biscuits and gravy! I ordered a white mocha because caffeine! and it’s one of the best I’ve had in a long time. 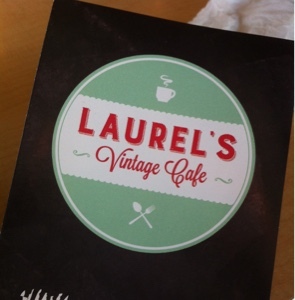 I’m looking forward to trying lunch here as well – lots of sandwich choices! *One thing to keep in mind, I’m a pretty patient and understanding person, so if I have to wait a bit because of a learning curve or because someone has a large order in front of me, I’m okay with that. If my order has a mistake, I tend to remember that no one’s perfect. My goal is not to critique, unless I have a terrible experience based on how a business owner/worker treats me (which has only happened once in this town). I just want to encourage people to support these businesses of ours and their hard-working owners so that we can build our downtown and surrounding businesses into something great! I’d love to see our town become a destination for out-of-towners because we have bragged it up so much! Wonderful! You’ve inspired me to try this little place. Thank you for such a sweet review. I agree with you, we should all support local Ripon. I have that same thought and shop and eat locally if at all possible. Is there any chance of them staying open for Sunday morning breakfast? We enjoy going to breakfast after church but not too many local, in-town choices. You have to try the turkey club with the homemade potato salad…heaven! Oh and the giant chocolate chip cookies!